Both of us were employed at the Unique Identification Authority of India (UIDAI), contributing to the goal of uniquely identifying every Indian resident, before we started on this experiment. It was a remarkable learning experience, working on a complex public policy challenge alongside some of the brightest minds in the world. At UIDAI, we had become aware of the many potential benefits of a Aadhaar (UID) – each stemming from getting access to identity and being able to prove it online – anytime and anywhere. For instance, possession of Aadhaar can be used to satisfy the Know Your Customer (KYC) requirements to open a bank account, acting as the first step in financial inclusion of the masses and enabling direct transfer of subsidies from the government to citizen. During our experiment – either through our own experience or by talking to the people we encountered – we realized that some of these benefits are more relevant than others to the average Indian. In our experience, UID’s benefits for food security, mobile inclusion, insurance access, and “aspirational credit” are the ones that should be of the highest priority. It is important to note that we have not focused on the aforementioned Financial Inclusion (FI) in these benefits; while FI may have tremendous benefits for the bottom of the pyramid, we had little interaction with it as we didn’t need to take out a loan and our cash carry was small. Before getting into the specifics, let’s have a quick overview of UID applications. 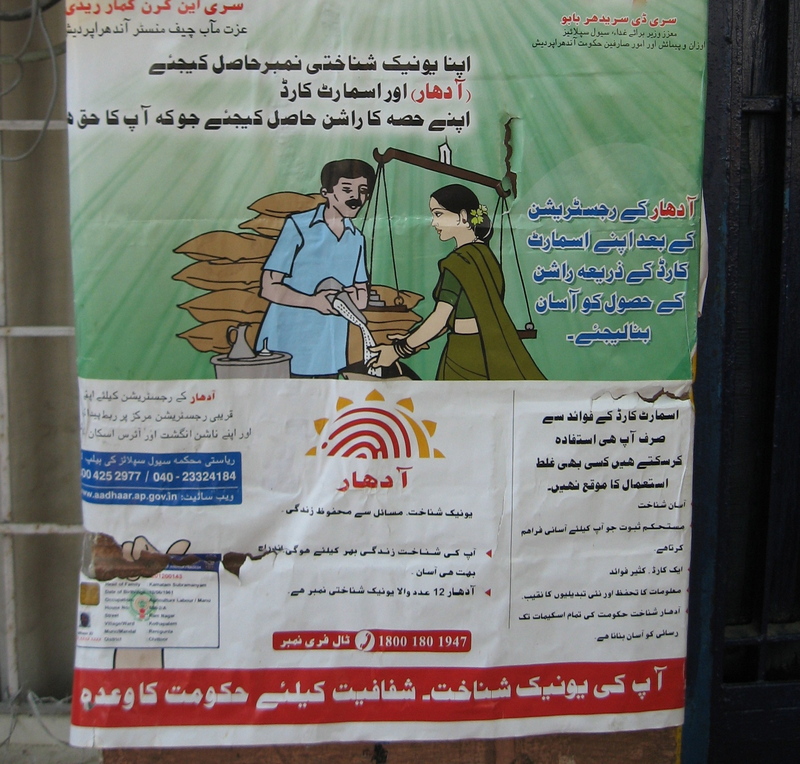 Broadly speaking, Aadhaar applications are information technology initiatives within government, and public and private sectors that utilize Aadhaar’s properties of a unique key and linked ID verification in their service delivery process. These applications can be used for identity purposes (Proof of Identity (PoI) and Proof of Address (PoA) transactions), or as a Unique Key to which data can be associated. The various benefits and risks of specific applications have been discussed elsewhere extensively, and so we are not going to get into the details here. FOOD SECURITY: Our most important challenge during the experiment was nutrition, as we discussed here. We were paying for all ingredients at market prices, as we did not have access to subsidized goods through the Public Distribution System (Rs. 100/day is much above the poverty line and as Rs. 32 is the cutoff we were just above it). Moreover, even if we were under the poverty line, we would not have received PDS subsidies in Kerala, as were domiciled in Bangalore. If PDS had at its disposal an online data hub with UID as a unique key and used UID authentication for every transaction , the non-domicile issue could have been resolved easily. Under such a set up, we would have established our identity not using a ration card, but using one of the many online authentication methods specified by the UIDAI. As such, the PDS shop would have been able to give our supplies based on our status in the data hub, which is available to the shopkeeper. We understand that there is the issue of supplies being different from state to state and that of supply chain challenges; this, however, can be resolved with smart accounting on the back end and pushing towards a demand drive supply chain. Moreover, we have already argued for the need for a gradient for the poverty line to mitigate the effects of a hard cutoff on those whose income is close to the poverty line. The UID-based data hub would serve as the foundation on which such a system would be built. The massive leakages individual authentication would help curb could lead to increased food security for all! More details can be found here. INSURANCE: Our ability to absorb a financial shock was greatly reduced even at Rs. 100/day. In fact, we set aside money from our every day budget (of course, we couldn’t do this at Rs. 32/day) to cover an emergency. We calculated a risk exposure ratio, using existing reserves and a lump sum from the day of the emergency. Thankfully, we didn’t have to tap into this and ended up using this for our trip to Kerala. But what if companies were able to provide insurance products to the average Indian through an installment plan? Government could subsidize such a plan for those that cannot afford it at increasing levels as incomes drop off from the Rs. 100/day level – similar to the Rashtriya Swasthya Beema Yojna (RSBY) program, except much more individually customized. For the private firms, UID would serve as the KYC tool, ensuring that fraud is minimized in the selling of and administering benefits from the insurance products. The government would take advantage, once again, of the resident data hub combined with Aadhaar KYC to identify those that truly need subsidies for insurance, leading to accurate targeting and reduced leakages. Insurance firms on the other hand could bring down their overall risk by tying beneficiary history/record with the UID number, therefore reducing average costs for customers and making insurance more affordable. ASPIRATIONAL CREDIT: During our experiment, we found no dearth of aspirations among the people we met. There was the day laborer, whose second biggest expense after food was how son’s education, and the auto rickshaw driver, who worked approximately 18 hours a day, to ensure a better life for his family. In spite of their trying circumstances, they were not looking for handouts from the government. What the government and the private sector can do, however, is to provide the necessary resources to support education, skills development, and other services that that enable social mobility to such individuals. Here, a similar framework, leveraging the power of UID, as the one we laid out for insurance above would be of tremendous benefit. Private sector actors could provide educational loans to people using UID for KYC, while building up a credit history system simultaneously. The government could step in and provide subsidies on financial products for that cannot afford market rates, as determined by the resident data hub. MOBILE INCLUSION: We have talked about before on how mobile is critical for everyday communications for people in the middle and bottom of the pyramid. This communication forms a fundamental part of India’s democracy. Given that mobile handsets are cheap, having mobile access is largely restricted to having the relevant documents to satisfy KYC mobile norms. Now that UID is getting accepted as sufficient KYC for mobile SIM cards, it will go a long way in enabling “mobile inclusion” of the masses. Benefits of mobile could in fact extend much further by having access to positive lifestyle enhancement services such as education, healthcare at low price points. However, access to those data services may need further subsidy interventions, that we shall discuss in upcoming blog posts. So, there you have it. In our experience, using UID for food security, mobile inclusion, insurance, and aspirational credit applications would have the most impact on the bottom of the pyramid. Once the extent of the impact is evident to those that benefit, it would lead to a virtuous cycle, increasing the utility of the very ambitious Aadhaar project. We wish Aadhaar Godspeed. Great work. Very nice and honest effort done by both of you. I am thrilled, excited but 400 million poor people don’t let my mind to settle down. I want to join you in your efforts if in any way i can. Please if you can revert back to this comment, i will be glad.I have so many things to share but can’t write all of these here. Excellent work. Good to see the young taking lead. I am a veteran from the Armed Forces ( Indian Navy ) and a senior citizen willing to contribute my might to the society for the better future for the society. There are many veterans like me who are more than willing to contribute, but lack a PLATFORM. I suppose we can work together, your energy, zeal, enthusiasm and our experience, knowledge would be a good mix. If my idea is appealing, do get in touch.